Hello everyone - lovely to see you. If you've not been by recently you will note the new design and see posts that are not always craft related. 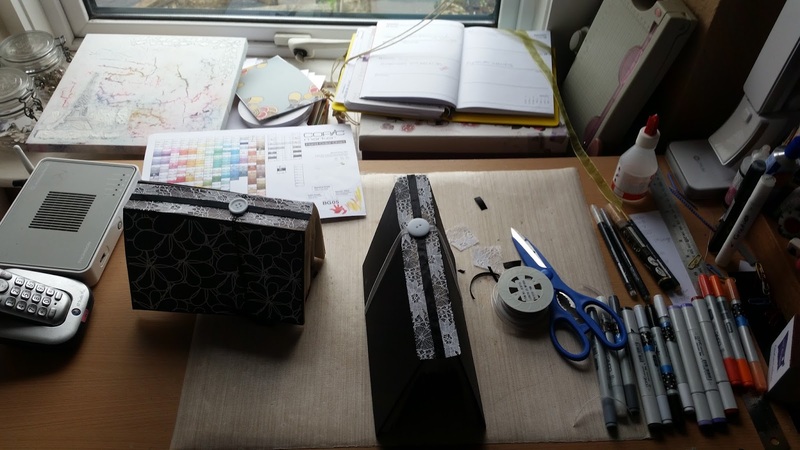 I've decided that as I'm not posting DT craft work now I will blog about all areas of my life. Would love you to still read them and leave me some love! Anyway am here to join in with Julia's Stamping Ground to share my desk. So the right side - usual pens and you will spot an image that's been coloured awaiting to be put onto a card. Window side sees 2 bookart projects that have been decorated and were drying overnight. I can't share one as it's recipient is online but I can share this 'MUM' one as my mum doesn't use the internet! I've inked it with a soft blue. it's mum's birthday next week so this is one of her presents. Do you think she'll like it?! So that's me. Off to the vets so that Baxter can have his annual jab. Will pop round as many desks as possible later. Am sure mum will love it, I know I would. Looking forward to sharing all aspects, makes a change some times but hope you still show us your lovely work. I love the Mum bookart....you're so clever and must have much more patience than me. Hope you have a great week. MM had to look to see the "mum" there Zo, am tad slow methinks .. wonderfully clever work! 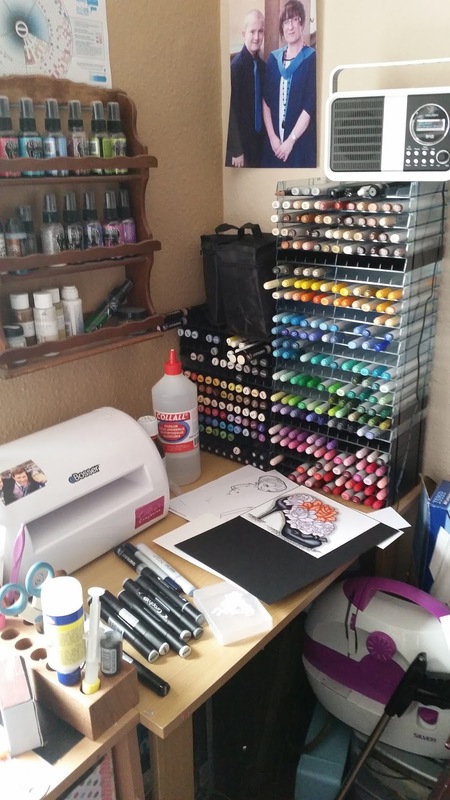 love your desky space too... great things there..
Wow - look at all of those markers! Thanks for visiting - have a lovely day! My daughter and I have pen envy! New design was a bit of a shock! I like it, looks very modern yet easy to read. Glad you have some new medications, it's good to revisit the scene sometimes instead of carrying on, medical science does not stand still in all cases. I hope they help to improve your life. A lovely busy desk. I just tried alcohol markers for the first time recently, and found I have too few colours :) will take me some years to gather as many as you have :) thanks for your visit, happy woyww! I'm sure your mum will love it. It's so unusual! The books are so unusual. Having done some adult colouring (wink!) I now understand why you need all those tones...I don't have enough! 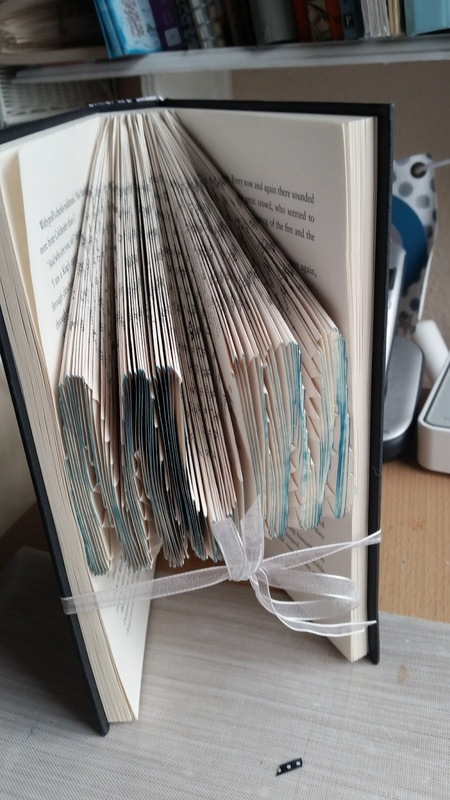 The bookart is amazing - I've seen quite a bit of it about lately and am well impressed with it, and haven't a clue how it's done!! I love all your colourful array of pens too, and the general busy and productive atmosphere in your creative space. Thanks for your visit and your nice comment - thanks for the hugs and good wishes, and I'm so glad you like my little box. Wow that book art is amazing. It's so clever the way it forms the word, I love it. I'm envious of your pen collection, I only have a few fineliners and I've just started the adult colouring. It's so hard with just a few colours, I keep wanting to break out the paints! That shoe in the first picture is just stunning. Handcrafted gifts are the best so I'm sure your Mum will love it. I almost didn't see the "MUM" because here in the Philippines, we would spell it Mom but when I figured it out I thought it was so clever! Happy WOYWW and thanks so much for already dropping by! 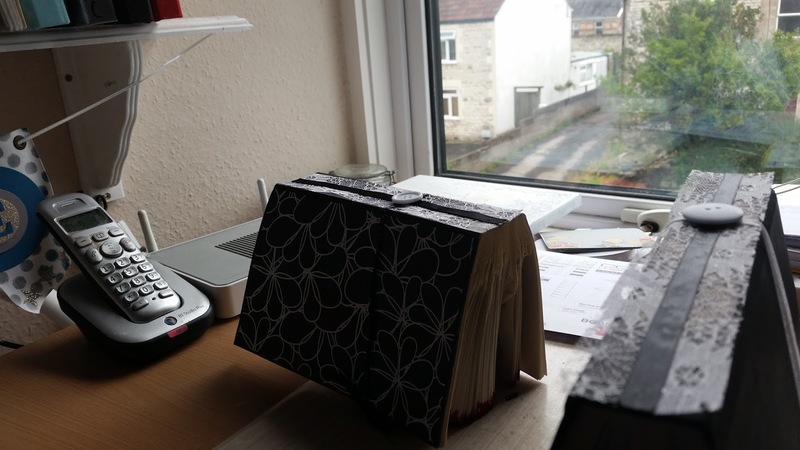 Fun post...I've always loved the book folding projects. Can't wait to see it opened up. I don't think I'd have the patience, but who knows life changes !! Thanks for the visit, always love the comments. Have a lovely weekend. Hi Zoe, thanks for visiting earlier. 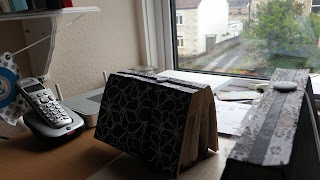 Book folding is a lovely art, I am sure your mum will love it. You must have the patience of a saint!! Yes, I think that's a good present. Love your colouring. I was wondering about the lovely colouring on the woyww anniversary ATC I received. Did you use a stamped image? It was gorgeous. Yeah, I think your Mum will love it! Supermzoom reveals a beautifully coloured image of course, and such a neat space, its calming my eyes! Loving the new look 'allround' blog. A great present - I'm sure your Mum will love it. Hope Baxter behaved well for the vet - have to take my daughter for Meningitis jabs before Uni next week so its jabs all round at the moment!! Such talent! Am sure your mum is going to love it! Would love to see it opened up. Thank you for stopping by my desk earlier. Appreciated the visit and comment.